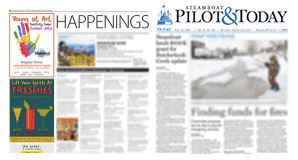 Councilwoman Petis wisely touts the benefits of water conservation in her Jan. 28 column in the Steamboat Pilot & Today. However, a close reading of the 2011 Water Conservation Plan, which she refers to, reveals issues that no practicable amount of conservation can mitigate. The Fish Creek Basin contributes approximately 75 percent of the city’s water. The remainder comes from Yampa River well fields. These sources are adequate to meet current needs and future development. The 2011 plan acknowledged the need to develop another source: “… it is a priority to explore water supply opportunities in the Elk River Basin.” This would create a redundant, looped city water supply that could provide approximately 3,000 acre feet of water yearly for West Steamboat fire protection and future development. Additionally, it would provide increased security to the city should current water sources become compromised. Petis states that, “the city has secured rights — and continues to work on redundant supplies.” Redundant supplies and facilities must be in place before any annexation takes place. Ensuring the health and safety of residents is the paramount responsibility of city government. The city must be proactive in developing and ensuring our community’s water resources for generations to come before considering granting water service outside current city boundaries.